We start with chickens. Not the kind to which I have become accustomed – i.e. fingers, wings. These colorful yard pets run free, much like cats and dogs back home, and for some of you, I’m sure you know them quite well. They even try to jump in our car. But without them, I would not have enjoyed those hard boiled wonders with my freshly baked bread this morning. It’s a childhood memory of clotheslines-ringing necks- boiling kettles that I associate with running wild chickens; I do not like them. Forgive me. 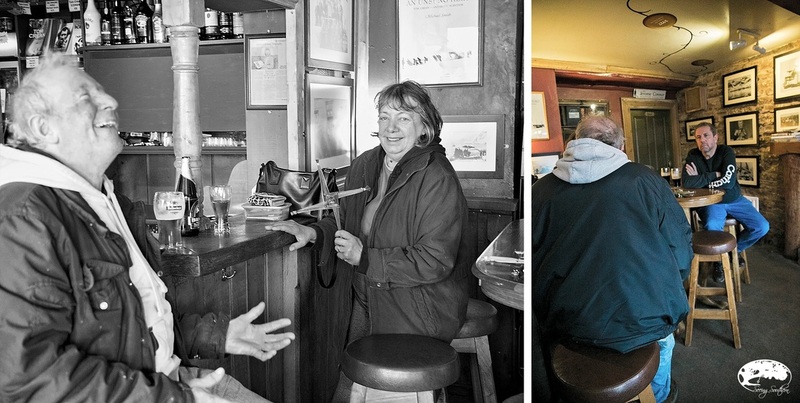 Maggie, our hostess, was once a Ireland tour guide, and she tells us of the South Pole Inn, located in Annascaul, which is on our way to Dingle. This is the hometown and pub Tom Crean, Antarctic explorer and dog handler on the Shackleford’s Endurance Expedition. Its landmark building hasn’t changed much since the 1950s; along the walls are photos and memorabilia of its native son. Opened as the South Pole Inn in the early 1920s by Crean and his wife Ellen, it is a simple blue two-story pub which sits beside the road. It’s a stop we must make. Our drive reminds us of home, rolling through the Chattahoochee Forest in Georgia. Lush greens, mountains meeting the (surprisingly) blue skies. However, we’re tooling along the country roads in Killarney National Park (UNESCO site) in County Kerry, a place that might not have been such a popular destination if it had not been for Queen Victoria. Her story, later. 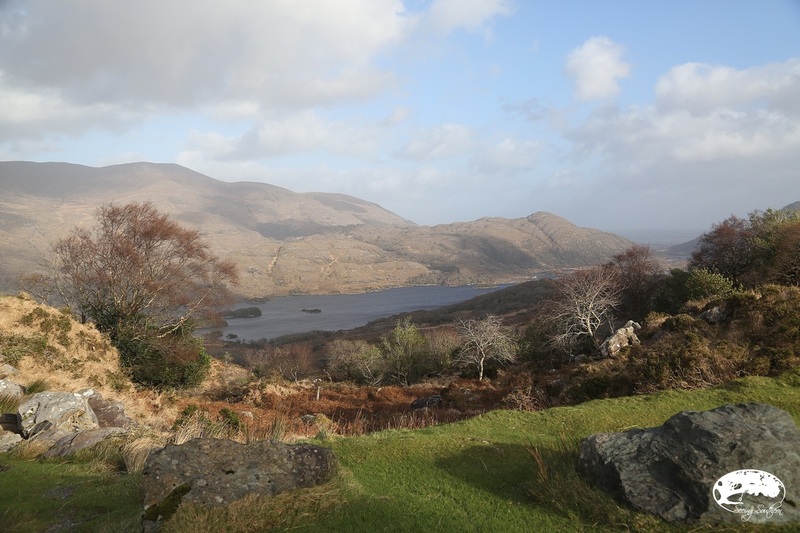 These mountains sweep down, touching the lakes of Killarney, an impressive 26,000 acres in all. As we meander through the mountains, now and then, hikers are seen, crossing roads, finding new trails, groups of likely best friends bundled in layers on their way to discovery. At some point in their journey, they will end up where we are headed, the central point in this park: Muckross House and Gardens. Muckross House is a 19th century mansion who once upon a time had a very important visitor, Queen Victoria. Henry Arthur Herbert and his wife Mary Balfour Herbert finished the home in 1843. Then in the 1850s, when Queen Victoria agreed to a two-night stay in their home, there was nothing that was too good for the Herberts (or their home). By the Queen’s visit in 1861, the budget had exploded, and the Herberts found themselves in financial ruin, thus losing the home. It was purchased by Lord and Lady Ardilaun who created gardens and the estate blossomed. Upon her death in 1932, the land and house was donated to the state in her memory. We spend the afternoon in Muckross House with hikers and as luck would find it, in the dry from a rain-soaked afternoon. During the winter, the farm is closed, but the tours continue through the home. Authentic pieces still remain, preserved with intense care. We see where Queen Victoria slept; she was given Mary Herbert’s room on the ground floor because she was intensely afraid of fire. The tour is 9 euros, well worth the cost to hear and view (no photography inside) history in its actual setting. It’s mid-afternoon, and we have a pub to reach. We’re in Annascaul, and if we hadn’t been looking, the South Pole Inn would have faded in with the other buildings. Len and I open the door and meet eyes. To the right, a blazing fireplace with a mantle stacked with books; in front, the bar keep. The walls are covered with posters, prints and paintings of Tom Crean. There are about a dozen people, all sitting at their own little table in clusters or at the bar, singularly enjoying a pint. As we enter, their conversation drops and their eyes focus on us. We freeze for just a moment, then look around, find two empty spots, and take off our coats. Conversation immediately picks up again about the latest Blindside episode. It feels more like a friend’s living room rather than the neighborhood watering hole. They immediately include us in their conversations, and we wonder what took us so long to find them. It is St. Brigid’s Day (celebrating the arrival of warmer and longer days), February 1, and John (originally from London) and his wife are selling St. Brigid’s crosses made of thatch reeds. We offer him five euros; his grin reaches across his face. “I finally sold one,” he shouts to his wife. "Another pint," he shouts to the bar keep, and they all break out in laughter. A pint of Guinness with our new friends and we’re off to Dingle. 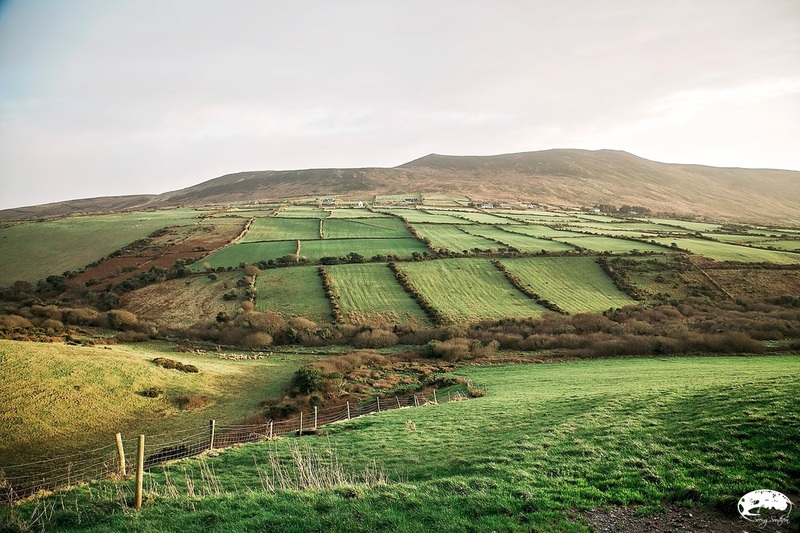 As we make our way to Dingle along the Dingle Peninsula, the views are breathtaking. The squared off plots of green grass, exactly as we have seen in our imaginations. The green, just as vibrant. The rock walls, just as solid and jagged. 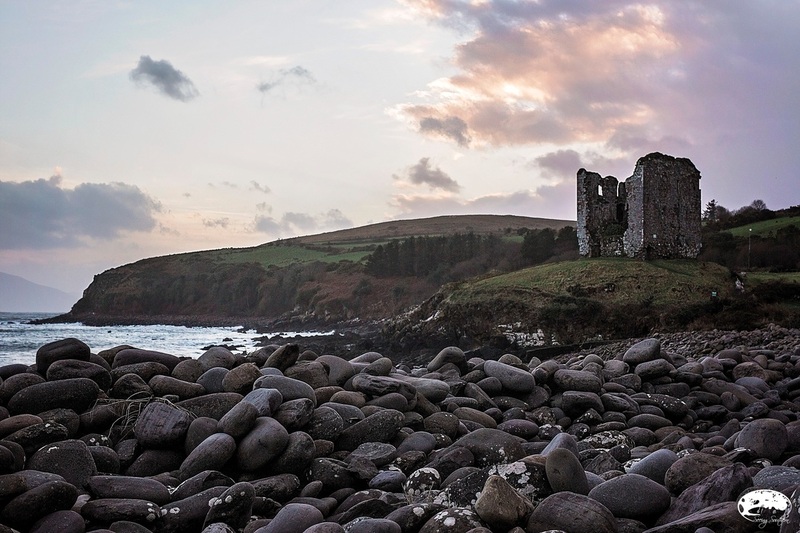 Before we reach Dingle, we turn left as we follow the signs to Minard Castle which is located on the water’s edge, its ruins overlooking the sea. It’s our first real look at the rugged cliffs of the coastline, majestic and powerful, especially at sunset. In Dingle, Bambury’s Guesthouse is new and modern and a welcome sight upon entering town. Bernie welcomes us and we check into Room 10, upstairs. We quickly drop our bags and head into the downtown/marina district. It’s a very cold and raw night, so rather than walking (which is very possible), we get in our coot coupe and drive the few kilometers in. Our friend at the South Pole Inn recommended John Benny’s Pub for dinner in Dingle. “For sure, John Benny’s,” he said when we asked for his pub of choice with good bar food. Tonight we dine with Yvonne at John Benny’s. We have the pub to ourselves, and she seats us beside the warm coal fireplace. We feast on Shepherd’s Pie, followed by Warm Apple Cake. At the end of the evening, we notice the walls filled with dollar bills, blackened with names and cities visitors call home. A reminder of Key West's Captain Tony's Saloon. We left our dollar there; we must leave our dollar here. Two Coots. Upon taking it to put tape on the back, Yvonne thinks she sees Two Fools. She breaks out in laughter, and we quickly correct. "No, we're just two coots, but on any given day, we might be fools." Len places our dollar in a strategic spot, and we both touch it in its resting place, hoping for its luck through the rest of our journey. Yes, we are again, two happy coots. It was a home in the country. We had the entire apartment to ourselves, and it felt like we belonged. Sometimes, you take a chance (with Airbnb) and you get really lucky! 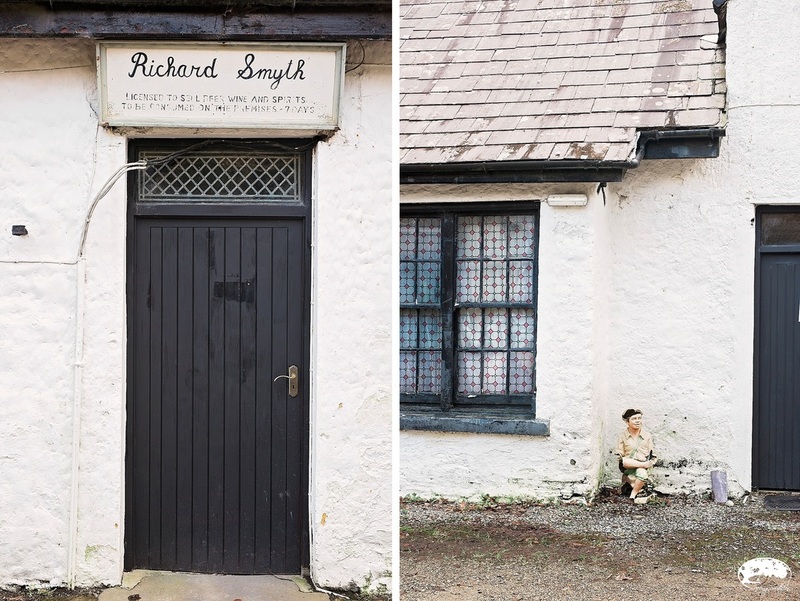 We saw very little of the city of Kenmare, but we relished the sights we discovered on the country lanes. On our way in, it was complete darkness. Today, we see what we have missed along the way. When we rounded the curve and saw just how close we were to the bay's shore, there is part of me that is glad it was dark. Located in County Kerry, it is the first national park established in Ireland. From castles to waterfalls, view for all. Muckross Estate is a fully working farm. During the summers, visitors get to see a traditional farm of Ireland in the 1930s and 40s. The daily chores and farming activities that were governed by the seasons. It's beauty and contribution goes way beyond the palatial home. Every white dot along the hillside is a sheep. No matter how far up, or how far down below, sheep are grazing. Sheep and their wool are as much Ireland as a pint of Guinness. The rural lands and the rugged terrain prove acceptable for sheep. The most common (below) is the blackface mountain breed and can put up with the cold and rain. We saw mostly sheep - very few cattle - in southern Ireland and it was only when we headed north that more cattle were seen. As sure as we're sitting here, the legend of Tom Crean will never die. These hearty souls will make sure of it. Along the southwest coast of Ireland lies a land that most people will tell you is Ireland's most beautiful place. It is the Dingle Peninsula, and for once, we agree. The peninsula stretches 30 miles into the Atlantic Ocean, where sea cliffs and rugged terrain provide protection. It's here you'll find the beginnings of the Wild Atlantic Way, Ireland's unforgettable coastal route. It never ceased to amaze us that no matter which direction we looked, we saw ruins. Many were discernible as homes or forts; most we crumbled stones scattered. Today, we see Minard Castle, majestically sitting along the Dingle Peninsula, and has stood since the early 1600s. We loved our evenings at pubs. Bar food, they call it. Quite different from the restaurant variety. People would always ask, "Do you wan bar food or restaurant food?" Always bar food. Much better, we agreed. There is no live music tonight at John Benny's; in fact, not a soul in the place except us and our server (that we can see). We like this January travel. We find seats. There are no lines. We get to enjoy each other. Sometimes, you just do the unexpected to receive the unexpected.